2011 Moto Guzzi Bellagio Aquila Nera. Picture credits - Moto Guzzi. Submit more pictures. The Bellagio embodies all the temperament of a naked in a stylistic identity that is unequivocally custom. Spoked wheels, drag bar and rear-set footrests are further details of a style that concentrates weight over the rear wheel, creating a clear impression that this bike really does stick to the road, ready to perform feats of blistering acceleration. Rear brakes: Single disc. Th 2 parallel pistons. Ask questions Join the 11 Moto Guzzi Bellagio Aquila Nera discussion group or the general Moto Guzzi discussion group. Get a list of related motorbikes before you buy this Moto Guzzi. Inspect technical data. Look at photos. Read the riders' comments at the bike's discussion group. And check out the bike's reliability, repair costs, etc. 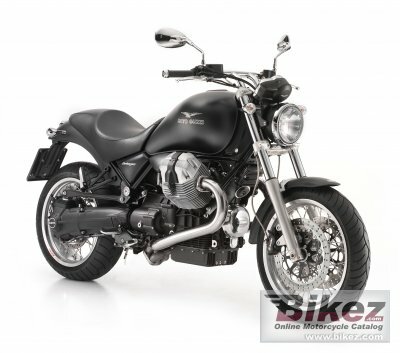 Show any 2011 Moto Guzzi Bellagio Aquila Nera for sale on our Bikez.biz Motorcycle Classifieds. You can also sign up for e-mail notification when such bikes are advertised in the future. And advertise your old MC for sale. Our efficient ads are free. You are also welcome to read and submit motorcycle reviews.